Isa Pond (伊佐沼) is a popular Lotus spot in Kawagoe, Saitama. There are many Oga Lotus, aka Ancient Lotus. 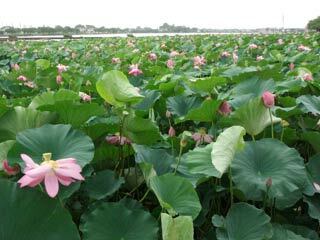 From the end of June to the beginning of August, the lotus flowers bloom, and many people visit here and enjoy its lotus. 2. use local bus to Isanumaboukennomori. Isanuma is the largest pond in Saitama, and 2nd largest one in Kanto region, next to Inba pond. It was named after Isa clan during Muromachi era. It is also popular Sakura spot in Kawagoe.